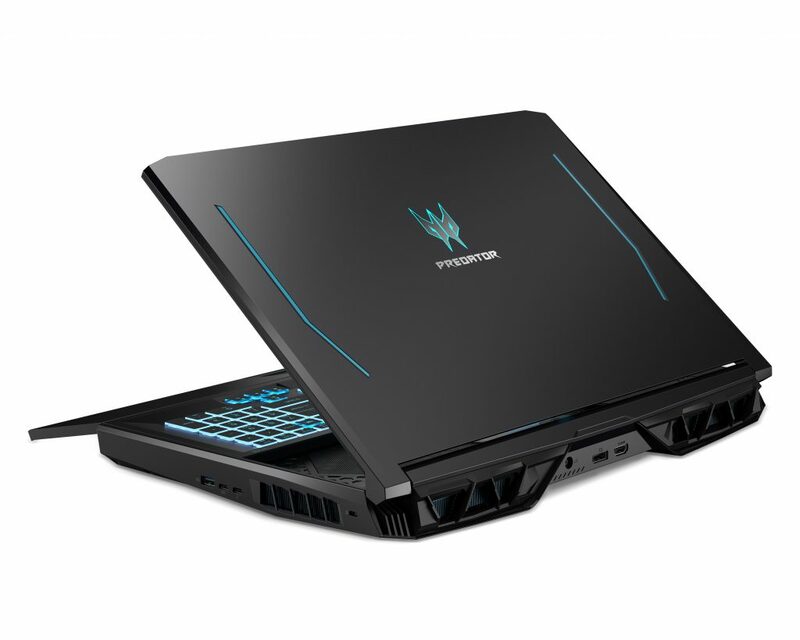 Acer unveiled two new Predator Helios gaming notebooks today at the [email protected] global press conference in New York. 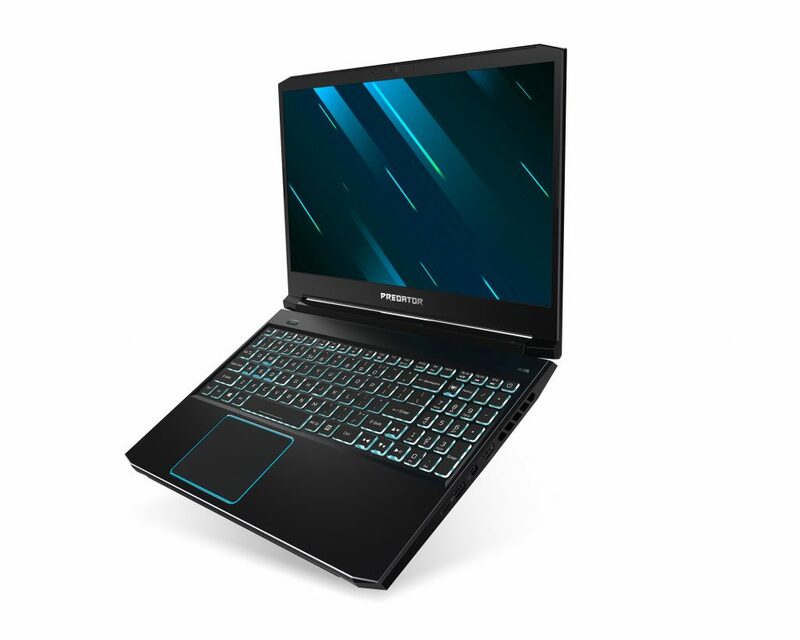 The redesigned Predator Helios 300 includes a sleek modern look and is powered by either up to an NVIDIA GeForce RTX 2070 with Max-Q Design, or the latest GeForce GTX GPUs, yet still retains its budget-friendly price tag. 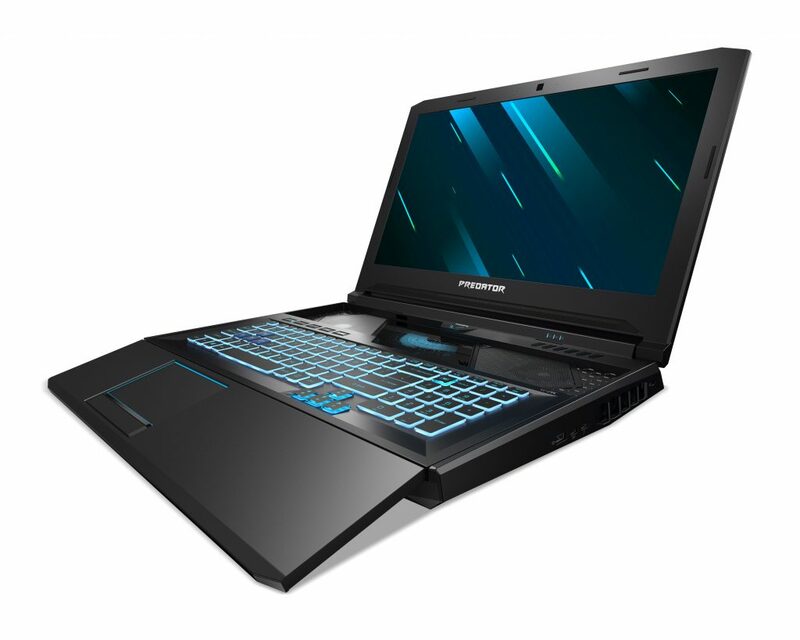 It’s well-suited for task-heavy computing, as its high-end hardware provides the performance needed for gaming, streaming, and video and photo editing. 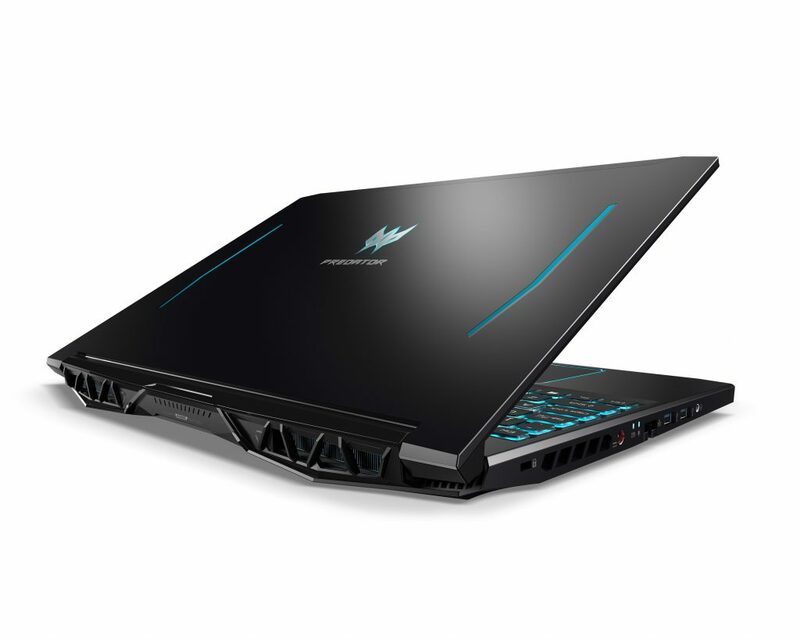 Powering the uniquely designed Predator Helios 700 notebook is an army of the latest and greatest technologies ready to battle, including up to an all-new 9th Gen Intel Core i9 processor for top of the line overclockable performance, an NVIDIA GeForce RTX 2080 or 2070 GPU, up to 64GB of DDR4 memory, and Killer DoubleShot Pro with Killer Wi-Fi 6 AX 1650 and E3000 — delivering up to four times more network capacity in dense environments than previous generation wireless AC networks — while plenty of high-speed storage keeps load times short. All that power makes games roar to life on the notebook’s 17-inch 144Hz FHD IPS display with 3ms response time and NVIDIA G-SYNC technology. Five speakers and a subwoofer keep the games immersive and engaging with full and realistic audio. One of the Helios 700’s most interesting features is also incredibly useful. 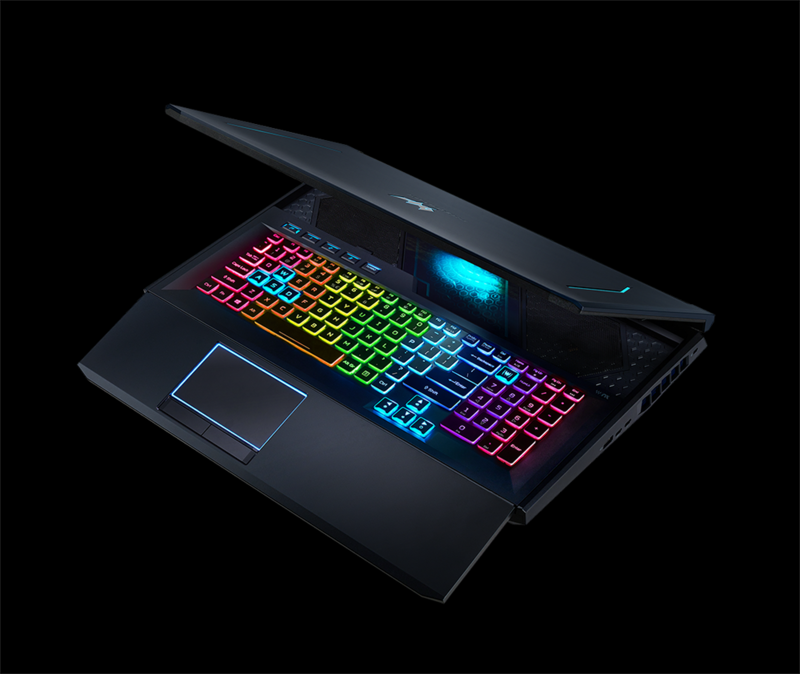 Its HyperDrift keyboard is part of the notebook’s thermal architecture, which consists of two of Acer’s custom-engineered 4th Gen AeroBlade 3D Fans, five copper heat pipes, a vapor chamber and Acer CoolBoost Technology. By simply sliding the keyboard forward, two additional air intakes are uncovered above the keyboard and below the display, giving the powerful heat-generating components extra air flow for maximum cooling and unleashed overclocking. The glass panel also provides a view of the notebook’s heat pipes. The HyperDrift keyboard improves ergonomics; with the keyboard closer now, gamers can keep a good distance to the 17-inch screen without overextending hands. It provides desktop comfort in a notebook form factor. The keyboard also features per-key RGB lighting, anti-ghosting and MagForce WASD keys. The MagForce Keys use analogue-like linear switches that trigger actuation immediately upon the initial press and increase up to 100 percent to give players more control over precise movements in the game. A Precision Touchpad is outlined with blue lighting and features two discrete mouse buttons below the pad for easy clicking. A Turbo hotkey quickly engages overclocking while the new PredatorSense hotkey provides immediate access to CPU and GPU temperatures, fan control, RGB lighting, and more. 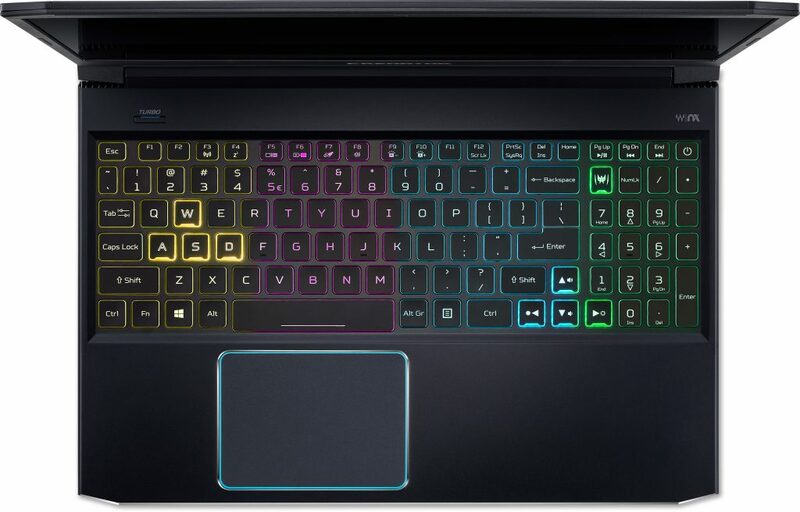 Per-key RGB lighting also enhances online gaming with Predator RGB Assault-League of Legends (LoL), by tieing in the keyboard’s lighting to the action on the screen while battling in LoL. 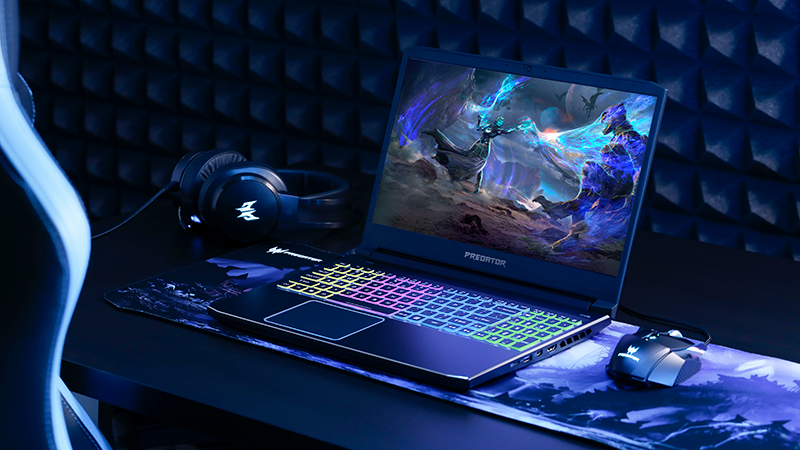 The best-selling Predator Helios 300 gaming notebook just got better with the addition of powerful technologies and features, along with a new sophisticated design. Gamers will be most excited about the combination of up to the newest 9th Gen Intel Core i7 processors for a premium performance of with the addition of the latest of an NVIDIA GeForce RTX 2070 GPU with Max-Q Design supported by a Turbo key for one-punch overclocking and Killer DoubleShot Pro for fast and lag-free networking. With up to 32GB of DDR4 2666MHz memory and up to two PCIe NVMe SSDs in RAID 0 plus a hard drive, it’s the powerhouse gamers crave for playing today’s AAA games. The most noticeable is the notebook’s new look. 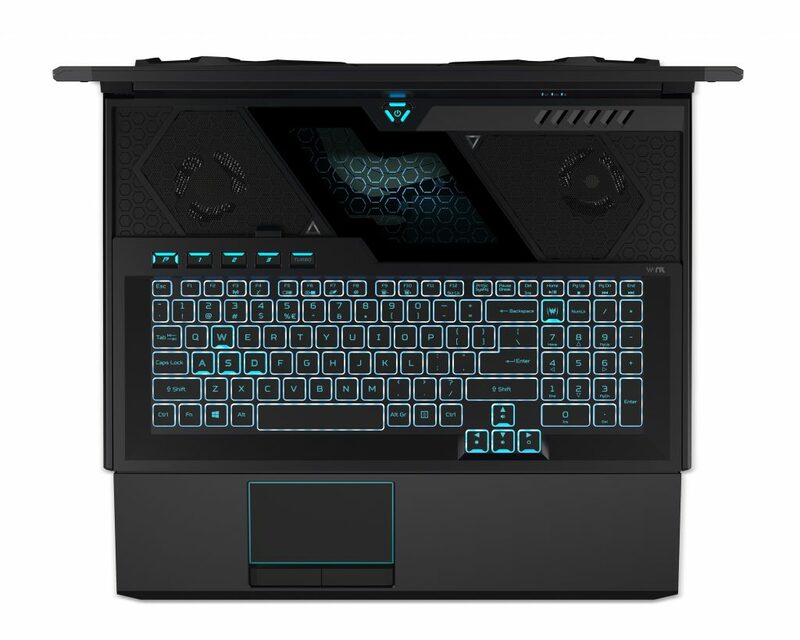 Its metal chassis now rocks the stylish teal blue accents and keyboard backlighting found on other Predator notebooks. A narrow bezel around the display and a redesigned keyboard with contemporary looking Predator fonts give it a hip and edgy look. Keeping the notebook running cool and at peak performance is an advanced and efficient thermal design that unlocks the true potential of the Helios’s powerful hardware. Most critical to keeping the temperature low is a dual-fan cooling system that includes one of Acer’s 4th Gen AeroBlade 3D Fans. This latest generation fan design was inspired by bionic silent owl flight mechanics that maximize airflow and minimize noise. The new 0.1mm-thin fan blades include a serrated edge, winglets along the top and bottom, as well as a curved fin along the inner portion of each blade. This results in up to a 45 percent improvement in airflow. Coupled with strategically placed intake and exhaust vents and Acer CoolBoost technology, the Helios 300 stays calm under pressure and handles intense overclocked gaming sessions with ease.